Kamarulzaman (right) pins the PJM medal on the lapel of Frankey Siren. KUCHING: The fourth navy base (region) to be sited in Bintulu will further strengthen security in Malaysian waters. Royal Malaysian Navy (RMN) chief Admiral Tan Sri Ahmad Kamarulzaman Ahmad Badaruddin said they were hoping to expedite construction of the country’s fourth naval base in Sarawak as they already had the nucleus (personnel and assets) for such operations, which would be undertaken by the Eastern Fleet Armada Command. “Sarawak really needs a naval base, and therefore it should be expedited so that the navy can place their assests in the state,” he said after presenting medals (Pingat Jasa Malaysia) to 24 navy veterans, and an ‘admiral on deck’ programme at the old State Legislative Assembly here yesterday. He added that everytime they anchored in Bintulu on their routine patrol, they always felt very touched by the local reception. “Our (navy) presence in Kuching or Bintulu has always been received positively by the local people,” he added. 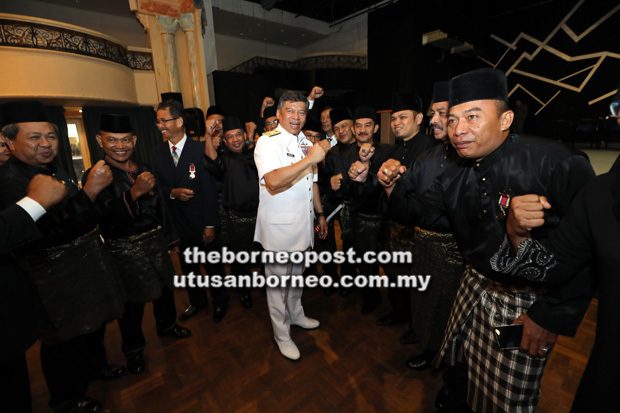 Kamarulzaman (centre) in a photocall with the navy veterans after receiving their medals. Kamarulzaman said the navy was very serious in protecting Malaysian waters, and having a base in Sarawak would definitely help much. On the naval base in Bintulu, he said the Ministry of Defence was now looking for a suitable site. At the moment, they are based temporarily at Bintulu Port terminal. Kamarulzaman said the navy’s presence in Sarawak would not only be good for the country but also good for Sarawak now that it had its own petroleum company – Petros. “There is, of course, the need to safeguard our natural resources, like oil and gas,” he said. Currently, the navy has three naval regions (bases) in the country, namely Region 1 in Lumut (Perak), Region 2 in Sepanggar (Sabah), and Region 3 in Langkawi. The fourth one will be based in Bintulu. On another note, Kamarulzamansaid he was very impressed by three schools here, namely, SMK Pending, SMK Kolej Vocational Matang Kuching, and SMK Seri Setia which had a Navy Cadet each. He encouraged them to check the navy’s website for career prospect in the navy. He said said there’s no quota set by the Ministry of Defence on those wanting to join the military or the navy as long as they were academically qualified and medically fit. On the presence of any foreign navy vessels on Malaysian waters, Kamarulzaman said those vessels were simply passing through as they have the freedom of navigation. 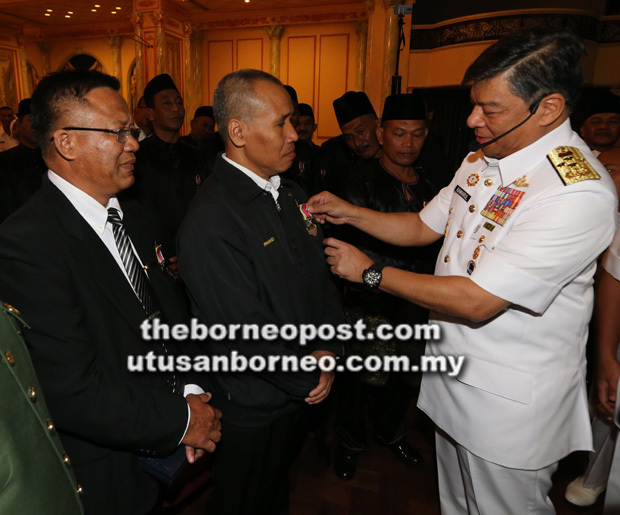 Earlier, he presented ‘Pingat Jasa Malaysia’ medals to 24 navy veterans of various ranks in Sarawak, which were presented by the Yang Di Pertuan Agong in recognition of their services to the nation. “Their presence here today shows their high heroism and partriotism spirit as former navy personnel,” he said.. Commander of the Eastern Fleet Vice Admiral Dato Syed Zahiruddin Putra Syed Osman was also present at the function.